If you hate bankers and politicians you aren't alone. But you may find it interesting that (aside from these two groups of people being notorious for corruption and greed), you may hate them for another reason - they really don't produce anything. Now of course, your Captain works in banking and you would be asking him the question, "why are you ripping on yourself?" But in maintaining intellectual honesty I have to admit, the banking industry doesn't produce anything. We provide a service. And that service is risk assessment and capital. Sounds boring, but it's vital to any economy. Why, could you imagine if banks did their job during the build up to the housing bubble that we would not be in this problem we're in now? But that aside, in the end, banks ultimately provide a service that should support the rest of the economy. They should not really become the economy themselves because "banking" is not really a consumable item. It's a supporting service. Ergo why Henry Ford (I believe it was) said something to the extent of "if banks and finance companies become too big relative to the rest of the economy, you have problems." So, in my biennial perusal of the NIPA accounts, I decided to calculate the financial services industry as a percent of GDP. Now, normally at this point in time I would continue on about the ramifications of this, and how this is more proof the entire economy is a debt inflated bubble, but I think we have all been reading Cappy Cap enough now that the economics lesson is self-evident. Besides, why waste time reading something you already know when you really should be enjoying the decline! So if one were to extrapolate the post 30's depression decline of ~ 65% we should expect 1950's levels to return in the next few months / years? Think of General Motors as a perfect example. Once a great company that made money from producing and selling cars. Then they became a bank, that happens to offers cars as part of their service. GM lost money selling cars, but made a profit from their GMAC banking business. That it not a very good business model.The GM story reflects the entire US economy. Once a great nation that produced things, now financial services are a huge part of the economy. Only if you throw in say WWII and supply all the allies with armaments, ration goods over here so that people save and even try and win the war. Oh, and sell war bonds too. Plus rebuild the nations we conquered and use the leverage we had to ensure that industry here supplied it. Did the banks finance that war or did the citizens do it via how many bond drives? Banks don't produce? What about time preference? Banks don't produce anything? What about time preference? Bankers do produce things, as services count as goods in the economy. The GDP consists of both the goods and services of the economy. Bankers may for the most part be a bunch of corrupt SOBs, but one of the major misconceptions about financiers overall, one that goes back centuries, is that they are just leeches on the system, that they just "move money around," but don't really contribute anything of value to the economy. This is not true. They provide very valuable services to the economy, providing specialized knowledge, and without them, the economy would not be able to function. No you're right, banks do play a vital role. My large point is what percentage of your economy is derived from a service that really is a supporting one. 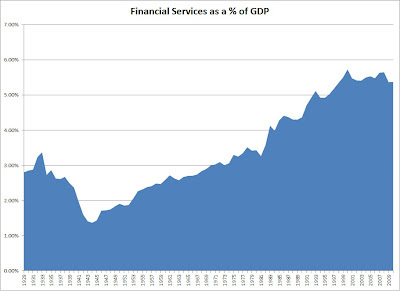 In otherwords, say back in the day it took 2% of your economy to be financial services to support the remaining 98%. Now, it magically costs 5%? Admitted, some of that is from banks with overseas revenues and operations, but when you consider I we would call it "non-GDP supporting" income (fee's, arbitrage, shoddy mortgage services, etc). there is a bubble. Pull Up a Chair with Cappy Cap! You Mean a Degree is NOT Experience??? Didn't They Get $50 Billion? Holy Sane City Council Batman! Wait, Wait! Lemme Guess! It's Bush's Fault!